Releasing the most advanced and seamlessly integrated US PAIR auto-docketing system. 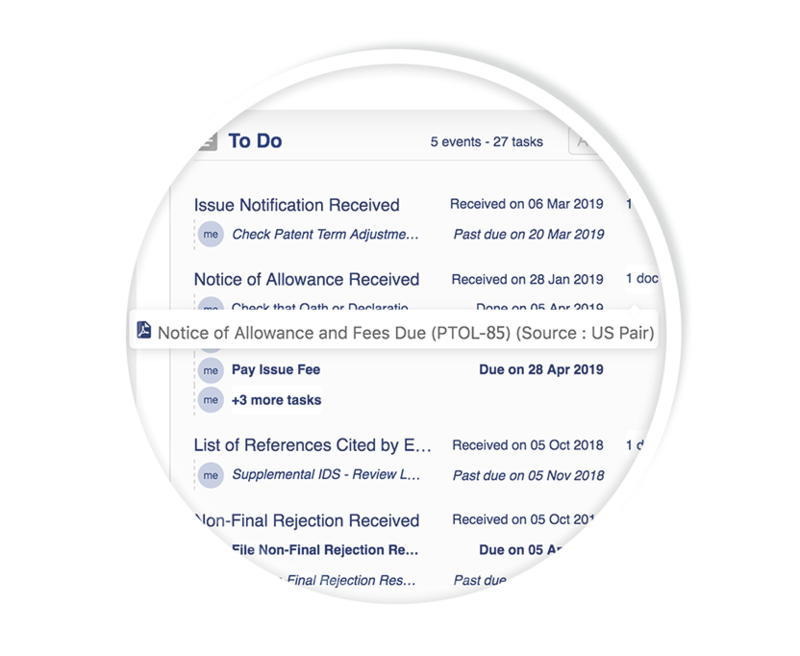 The unique auto-docketing feature automatically creates tasks associated to statutory events as soon as they are published on the USPTO website (US PAIR). As soon as an official letter appears on US PAIR, the « Respond to Office Action » task is immediately created in Orbit Asset and the official letter in PDF is automatically attached to the task. All elements allowing the user to lead the task are readily available (deadline, reminder and document). Automate 100% of your US statutory event tasks. Never miss US statutory events. Always be up-to-date with US statutory events and tasks. Easily access all US official documents. Retrieve and organize all US file wrappers directly in Orbit ASSET.